The Gowanus Lounge: The "Brooklyn Robot Parade"
More Photographers, Reports and Bloggers than Robots, originally uploaded by rsguskind. The Brooklyn Robot Parade attracted more photographers (self, for instance), writers (self, again) and bloggers (yup, as of now) than robots. A shame because judging by the two human robots and one dog (with minimal robot costume), a big turnout would have been visually interesting. 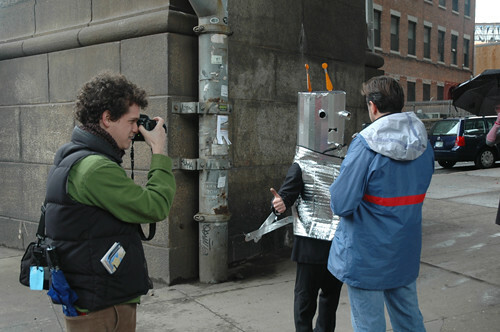 In any case, a good opportunity to photograph people photographing and interviewing "robots." The Flickr NYC Social group walked right by you.